If you believe that technology is the “holy grail’ of healthcare, if you believe that it will make all our problems disappear, you have to think again. Technology alone will never suffice our current needs to improve our healthcare delivery system. If you notice, whenever technology solves an old problem, it also creates a new one. For example, the digitization of our medical records can surely improve coordination and efficiency in healthcare, but it can also raise extreme concerns on security. Technology, indeed, has a lot to offer, but it also has inherent limitations that we should supplement and resolve. This is why whenever somebody complains about it, my usual response is; “there are three important things that we need to keep in mind to ensure significant benefit from technology. These are policy, policy and policy”. Technology and policy should be like Bonnie and Clyde or Batman and Robin in any technology solution. The limitations of technology should always be supplemented by a robust policy and procedure. That is why a good nursing informatics practitioner should be well-versed in formulating effective policies. It is, however, difficult to formulate one which can comprehensively cover all facets of issues that we need to resolve. We need to be precise in our language. We need to be realistic and responsive to the circumstances involved. We need to be sentient to the needs of the organization. There’s a lot of things that we need “to be” in formulating policies that a neophyte nursing informatics professional may find challenging. “Grizzled Veterans” – More focused on governance and change management. In short, it’s probably helpful if you have a little bit of both characters. You will need to worry about the software, the menus, the dialog boxes, the MLMs, your hosting, and your tablet computers if you want to garner support for your EMR implementation. So even though I’ve written about policies before, I thought I’d write a little bit about the “tricks of the trade”. This is the little trick you’ll want to keep hidden, your lightsaber you’ll carry on your belt. Only wield it when needed, and only use it for good. A policy is your opportunity to set a standard. It’s a document defining the standard. POLICY : All readers of Dirk’s Blog will be brought a coffee and donut on their arrival for work in the morning, according to the procedure outlined below. Minion will await arrival of Dirk’s Blog Reader. Minion will give donut and coffee to Dirk’s Blog Reader, on their arrival. It’s complicated because people don’t generally think that clearly without training. It’s really easy to get clouded up, especially in healthcare, where you are trying to satisfy many regulatory issues, and dealing with very technical procedures. But alas, I’m here to provide some guidance! 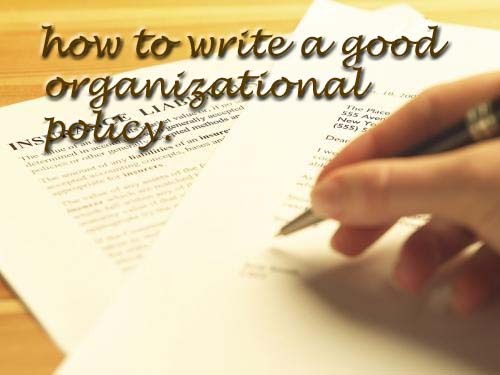 Once you’ve mastered writing a good policy statement, you can proceed to the procedure. The best way to write a clear procedure is, again, to explain the who, what, when, where, how, and why, which together will tell you “how to achieve the goal”. Remember, the key to good policy and procedure writing is clarity. Less is often more. “Generous use of white space” is what was recommended to me once. It takes some practice, but once you learn the pattern to good writing, it doesn’t need to take too long. In fact, you eventually get to the point where someone is discussing a problem, and you can start to envision the policy and procedure in the top of your head. This is why good policy writers are worth their weight in gold – Good policies can help you make change, achieve clarity, and save your organization time and money. Bad policies do not make any organizational change, do not achieve any clarity, and will cost your organization in both time and money. Would love to hear other people’s stories about writing policy and how it related to their EMR implementations! If anyone has any questions, please let me know! Thank You Dr. Stanley. You can find his blog on the link below.